If you follow my FB page you'll have read that I had a bad day on Wednesday. Went into the tunnel to feed the fish early in the morning - walked up to the tank and saw a fish crispy on the floor. Totally gutting. Walked around the vortex tank, and noticed a long line of them on the floor! 9 in total. Including my best tancho, and 1 of my best 3 kohaku. It might have been the best one infact. Root cause - koi keeping mistake on my part. I'd been changing water in the tank over the last 48 hours to wash out a fluke treatment. And I simply changed to much water, too quickly, and over too long a period. I chucked in a bunch of dechlorinator straight away and a few hours later the fish had calmed down. I can't tell you the feeling that morning. All the effort I've gone to. All the failures in the spawning vat, the effort that took - and yet, I have these 100 or so with prospects. And I lost 9 through a koi keeping error! They were the first fish I've lost out of the 25k I've reared this year - which doesnt sound too bad when you put it like that. But, that's a very positive spin on a tough situation. I found high nitrite in the evening, and added salt to detoxify that for the koi. Another positive spin, is that there are still quite a few nice looking ones in there.... And, I'll be taking a closer look (with pics and measurements) on Saturday. On the upside, I had John Stevens over on Wednesday to change over my filtration on the main keeper tank. 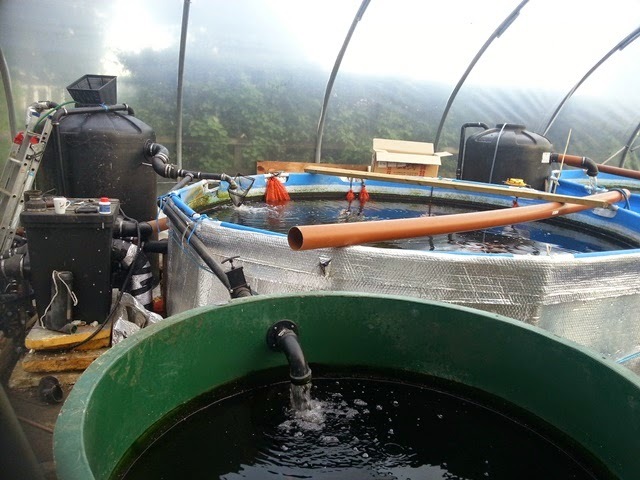 I'm upgrading to a larger aerated K1 chamber which will take around 500 to 600 litres of K1. I might even get 700 litres in there if I'm lucky. The roto barrel on the left is the new one. These ex orange juice containers are around £200 delivered and make super biological filters. A bit large perhaps to hide in the corner of the garden, but perfect for my set up in the tunnel. The orange sacks you can see hanging in the tank are filled with alpha grog that I had sitting in the previous bio chamber - I'll transition these out of the tank over the next couple of weeks as the new K1 gets up to speed. Tank temperature is in the low 20's C and 100l of see K1 from the previous bio chamber will get this new setup flying in no time. 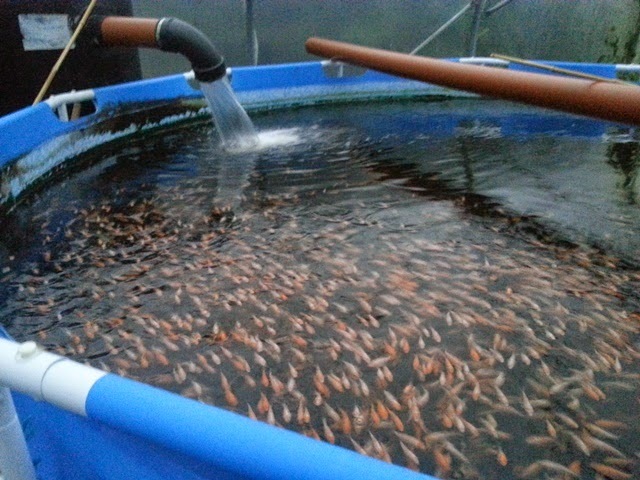 And, a picture from when I got home late this evening - the new fry are coming along well. they're growing, and the patterns are coming out. I can see some pretty decent ones in there. And the body shapes also look really good.